GRAMMY Award winning band Paramore and Sixthman, the industry leader in music festivals at sea, have just returned to shore after the sold-out Parahoy! Deep Search cruise. The third annual journey was a four-day adventure from Miami to Nassau, Bahamas that took place from April 6th-10th, during which 2700 guests from 32 countries boarded Norwegian Jade and were treated to a variety of performances, activities and experiences. Paramore performed 2 pool deck shows as well as special “mini set” acoustic performances in the ship’s intimate Stardust Theater. Those performances saw “Grudges” performed live for the first time and the band being joined onstage by Aaron Weiss (mewithoutYou) for a live performance of their collaboration, “No Friend.” Guests became the stars during “Paraoke,” performing Paramore songs while the band cheered them on from just feet away on stage, laughed as the band judged a belly flop contest, and one lucky duo played ping-pong with Zac Farro and Taylor York. The band also took cruisers’ questions during a pool deck Q&A session. "This was by far the best experience we’ve had at sea with the fans who have helped us – for the last 13 years – build up an international, multi-cultural, community full of music lovers," says Paramore frontwoman Hayley Williams. "Paramore is a band, yeah, but it’s not just a band. We want it to be about people and community and connection, and that goes far beyond the three of us. 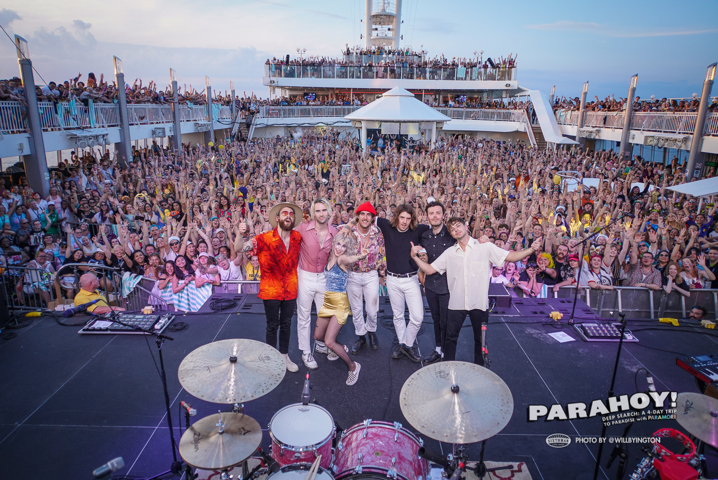 Parahoy! helps make that into a real, tangible thing." Joining the Parahoy! Deep Search lineup was Local Natives, Judah and the Lion, mewithoutYou, Now, Now, Halfnoise (fronted by Zac from Paramore), Mija, and comedians Jordan Rock and Ryan O’Flanagan. In addition to 3 shows from each band, guests participated in "Deep Search: The Relay" with Judah and the Lion and enjoyed a "Family Feud" battle featuring MIja and mewithoutYou. Kelcey Ayer from Local Natives held a craft beer tasting as well as guacamole-making demonstration in the "Guac Test Kitchen." Guest jams, DIY craft stations, movie screenings, makeovers with "Good Dye Young" stylists — a hair dye brand founded by Hayley Williams — and more created an atmosphere that demonstrates the community that Paramore has created around the globe. 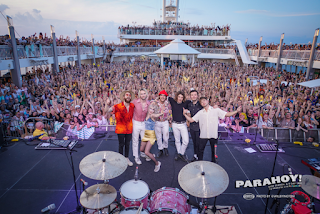 42% of guests were first time Parahoy! cruisers, 35% were returning for a second time, and 23% of the guests have enjoyed all three cruises. Throughout the voyage, cruisers donated over $7,000 in support of Crisis Text Line, a free, 24/7, confidential text line for those in crisis. "Thanks to all the bands who made this such a fun show for all the fans on board," continues Williams. "Thanks to the fans for making this an experience that is just as rewarding for us as we want it to be for everyone else."